Retired ex-School Psychologist, worked in a middle school in the South Bronx. living outside of NYC. Not an expert, never claimed to be, never will be. Became LM over 35 years ago but don't ask me how? Frequently play on BBO - (Double !) 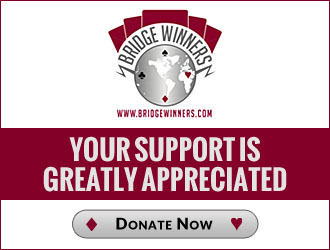 but play live bridge relatively infrequently. Memory and attention/ concentration skills are clearly not what they once were. If I post a problem or OP, even if it seems like such a no-brainer and elementary to you, something likely occurred at the table where a disagreement occurred or there was some difference in approach or style. So please view it as respecting and appreciating your input. The more you learn, the more you realize how little you know - scary! What does this bid mean? Sequel to "A simple, little survey". A real Irony if true. Is Match Point Precision actually illegal in acbl-sanctioned pairs games/events? What does this 3♦ bid mean?